Tuft here with a photo from a fun horse show I went to in late summer. My sister, HorseFeathers, participated in several shows in our area for the annual fall roundup. 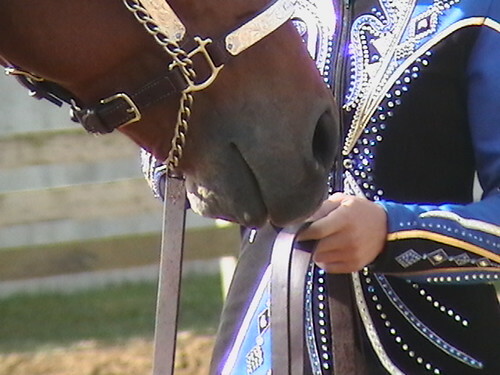 One of my favorite exhibitions to watch was the showmanship classes. To see how all the horses listened to their handlers on command was amazing. I experimented with the camera a bit and came out with this closeup photo. I believe it shows the unity of the horse and girl and how they respond to each other. My sister didn’t win the show but she said that first experience of showmanship will stick with her for her entire life as a horsewoman. This was taken by my little bro, Tuft. I never knew you had it in you. He can be a rambunxious little colt at times but then he surprises me with photos like this. Wow- that’s beautiful! What is the horse’s name? Thanks everyone! I don’t know what that horse’s name was I just took a bunch of pictures of the contestents. My sister’s western horse’s name is Dude’s Midnight Zip.. or just Midi.